The iPhone 5 is using the new 'Lightning' port which means we all need to buy dumb, expensive adapters if we want to keep using our old accessories. Unfortunately, those adapters don't support video and iPod out. It's okay, it's not as bad as it sounds. It's still not good—especially for those people who use their iPhone for video out—but iPod out doesn't exactly mean your iPod speakers are now dead and useless, instead, iPod out is a feature that some car manufacturers (BMW, for example) use for their in-car displays. iPod out lets cars basically port the iPod interface onto their head units and control it from the car. With the adapter, it can no longer do that. You'll likely have to control your music from the iPhone and not your diamond-encrusted steering wheel. Annoying, to be sure. But hardly the end of the world. 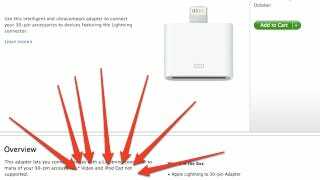 Update: Apple told the Verge that Lightning to HDMI and Lightning to VGA cables "will be available in the coming months". Hooray? More cables to buy as these ripoff adapters still won't work.